Leading manufacturers use NamPower nylon abrasive disc brushes to automate secondary operations such as parts deburring, edge blending, and surface finishing. These professional-grade brushing tools from Brush Research Manufacturing (BRM) are also ideal for outer diameter (OD) surface preparation, parts cleaning, resurfacing, and fine blanking. By harnessing the power of NamPower technology, your manufacturing company can improve part quality and consistency while eliminating time-consuming, labor-intensive, manual operations. You can also maximize your investment in automated equipment such as CNC machinery, transfer lines, and robotic cells. First, however, you’ll need to choose the right NamPower disc brush for the job. 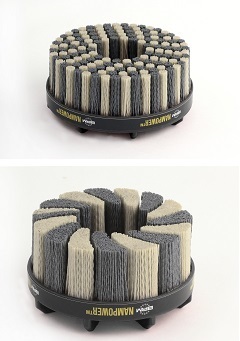 NamPower nylon abrasive disc brushes come in two types: dot and turbine. Both types are made of flexible nylon filaments bonded to a fiber-reinforced thermoplastic base. BRM also supplies lightweight tool holders that put less stress on machine spindles and that support flow-through cooling. Because coolant is dispersed from the brush center instead of from the edges, heat generation is reduced. Each type of NamPower disc brush provides high-quality results, but do you need dot style or turbine style tools for your application? Dot style tools allow easier entry into small holes and spaces. With their greater flexibility, they’re ideal for lighter-duty deburring and surface finishing. Turbine style tools have a high-density fill for medium-duty to heavy-duty deburring. They cut faster and provide short cycle times. NamPower nylon abrasive disc brushes are available in five diameters: 50-mm, 60-mm, 80-mm, 100-mm, 125-mm and 150-mm. The three smaller diameter tools (50-mm, 60-mm, and 80-mm) are great for harder-to-reach areas, smaller parts, and planetary head mountings. So what’s the OD of the part you need to finish? As a rule, brush diameter should be larger than the cutting tool used to machine the part. 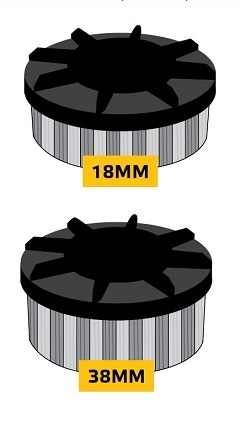 All NamPower nylon abrasive disc brushes are available in two trim lengths: 18-mm and 38-mm. Brushing tools with shorter trim lengths are more aggressive, but less flexible. Conversely, brushing tools with longer trim lengths are less aggressive, but more flexible. Does your deburring, edge radiusing, and surface finishing application require greater flexibility, or more aggressiveness? Standard NamPower disc brushes use a combination of white ceramic and silicon carbide abrasive to produce maximum burr removal rates and achieve an optimum surface finish at the same time. Custom NamPower mini disc brushes (50-mm, 60-mm, and 80-mm) are also available, and feature a combination of blue ceramic and silicon carbide, or blue ceramic only. 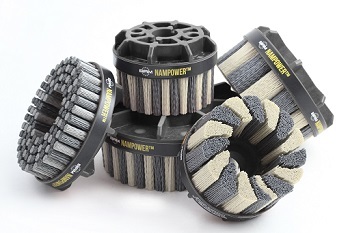 NamPower nylon abrasive disc brushes come in four grit sizes: 80, 120, 180, and 320. To determine which grit size you need, consider the starting surface finish and the amount of material refinement that’s required. As a rule, choose the coarsest grit that will still yield the required surface finish. Then use a finer grit tool, if necessary. Coarse grits are also recommended for heavier burrs, or if a finer finish isn't required. Learn More. Get NamPower Resource Guide. Are you ready to learn more about brush types, brush diameters, trim lengths, abrasives and grit sizes for NamPower nylon abrasive disc brushes? Then download the NamPower Resource Guide today. This free, full-color technical book from BRM provides charts for key specs and also describes operating parameter and application guidelines. Get your copy now.